Pittsburgh advances to play at Kansas City in Divisional round. PITTSBURGH (AP) — Le’Veon Bell spent the last two Januarys watching helplessly while the Pittsburgh Steelers tried to make a deep postseason run without him. The ever fluid running back made up for lost time Sunday against the Miami Dolphins. So did Ben Roethlisberger and Antonio Brown, the other members of Pittsburgh’s “Big Three” together in the playoffs for the first time. Pounding away relentless at a defense that hardly seemed interested in stopping him at frigid Heinz Field, Bell ran for a franchise postseason record 167 yards and two scores . 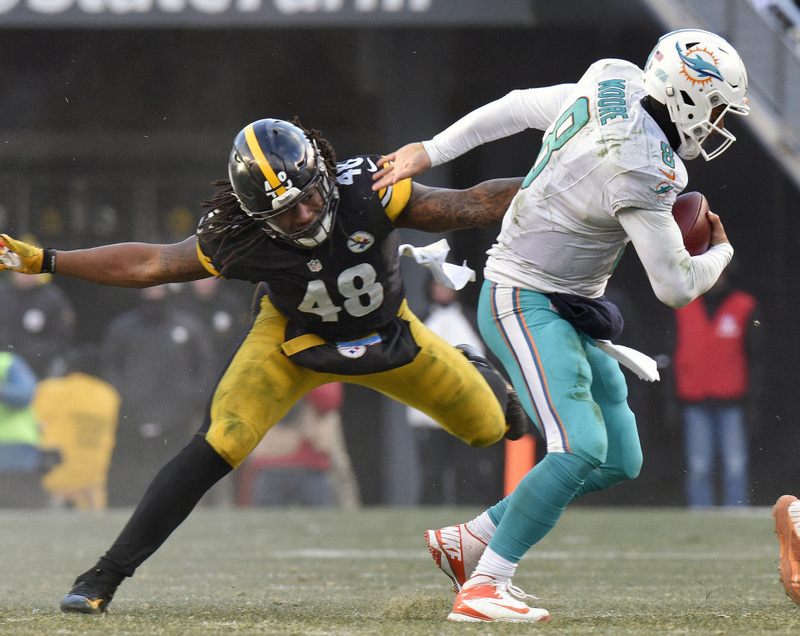 The Steelers overwhelmed the beaten-up and mistake-prone Miami Dolphins 30-12 on Sunday. “We wanted to go out there and make a statement,” Bell said. Bell, Brown and Roethlisberger, who wore a walking boot on his right foot afterward, more than wiped away the bitter aftertaste of a 30-15 whipping at the hands of the Dolphins in mid-October. Given a shot at redemption, Pittsburgh didn’t let it go to waste. The Steelers (12-5) led by two touchdowns before the game was 10 minutes old on long touchdown passes from Roethlisberger to Brown. Miami never got closer than 11. Certainly, at least, teams like the Dolphins (10-7). Given a chance to prove their first playoff berth in eight years wasn’t a fluke despite being outgained and outscored during the regular season, Miami never found a rhythm. The problem wasn’t the single digit wind chill or a vicious hit absorbed by quarterback Matt Moore in the second quarter as much as it was the Steelers. Pittsburgh sacked Moore five times, forced turnovers on three consecutive possessions in the middle of the game, and never really let the Dolphins up off the deck. Pittsburgh (12-5) ran off its eighth straight victory to set up a visit to AFC West champion Kansas City (12-4) next Sunday. The Steelers rolled by the Chiefs 43-14 on Oct. 2. “We have to understand the same passion and dedication that we put in this week to beat Miami, that’s how Kansas City is going to try to beat us,” Bell said. At least Bell will be around for the challenge. He missed the playoffs each of the last two seasons with knee injuries. All he did in his postseason debut was break Hall of Famer Franco Harris’ team mark for yards rushing in a playoff game. Harris ran for 158 yards in a Super Bowl win over Minnesota 42 years ago. Bell reached that total by the end of the third quarter. The Dolphins tried to hype themselves up by running around in shirt sleeves in the single-digit wind chill during warmups. Steelers linebacker Ryan Shazier did them one better, racing around shirtless – as if to send a message that his team is plenty comfortable playing this time of year. The Steelers scored on their first three possessions, and Miami’s playoff victory drought was well on its way to 17 years and counting. Miami running back Jay Ajayi managed just 33 yards on 16 carries, or 171 yards less than he piled up against Pittsburgh in October. Roethlisberger completed his first 10 passes and finished 13 of 18 for 189 yards with two scores and two interceptions. He also sported a walking boot on his right foot while talking to the media after the game as a preventative measure. Roethlisberger tweaked the ankle while throwing an interception on Pittsburgh’s penultimate drive. He sprinted off the field afterward and said he will be ready to go against the Chiefs. Moore appeared to be out of it when Pittsburgh linebacker Bud Dupree launched into him midway through the second quarter just after Moore released a pass. Moore lay on his back for several moments before slowly getting up and making his way to the sideline. Amazingly, he missed only one play after getting cleared by an independent neurologist as well as a team doctor. The 32-year-old stressed it looked worse than it felt. Dupree was hit with a 15-yard penalty for unnecessary roughness. The Dolphins badly missed cornerback Byron Maxwell (ankle), out a third straight game. Miami held Brown to four receptions for 39 yards in October, but he topped that total before the game was three minutes old. Pittsburgh avoided any major concerns heading to the divisional round, though tight end Ladarius Green (concussion) was inactive for a third straight week.